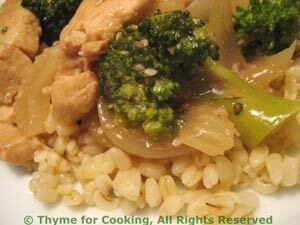 Stir Fried Chicken and Broccoli with Barley, Healthy Weekly Menu Plan. This is based on a new (to me) cook book called Whole Grains, by Lorna Sass. I like the idea of doing a stir-fry on barley rather than rice. I use quick-cooking barley... Yes, I know, not as healthy as the slow variety, but still good! Toast the sesame seeds first if they are not already toasted. Add crushed red pepper flakes if you like some heat, and/or use a hotter mustard. The prep: In a small bowl mix the sherry, soy sauce, vinegar, mustard and sugar. Cut chicken into bite size pieces. Add to the bowl with the sauce, stir to coat. Dissolve the cornstarch in the chicken stock and set aside. To cook: In a large skillet or wok heat half of both oils over medium-high heat. Add celery, onion, and stir fry 3 minutes. Add the rest of the oils to the skillet. Remove chicken from sauce, reserving sauce, and stir fry 3 minutes. Return the vegetables to the pan and add the reserved sauce. Bring to a boil. Reduce heat, cover and simmer for 3 - 5 minutes longer, until the broccoli is just tender, but not over done. Give the cornstarch/stock a stir to recombine and add it to the pan, stirring constantly until thickened. Cook barley in chicken stock, covered, over medium-low heat until done.